Retail Sales Website Packages from iNET image, inc.
"Update Your E Commerce Website From Your Desktop In Real Time." Order Today and Start Selling Online Tomorrow! Five Page Website to Showcase Your Business. The iNET RealTime System, which will allow you to display and update your website content, including your complete product listings, in minutes from your own computer! Experience how easy it can be, try our working demos. This is not a do-it-yourself website. We create your website using your chosen website design and business information! Why iPACK Retail Complete Website Package? Unlike most web packages in this price range, your website is created for you. No complex "do it yourself" web building tools. Your account representative is here to help. You do not have to depend solely on help files or forums to get help understanding the management of your products. Don't be fooled by the promise of large amounts of disk storage and huge amounts of bandwidth and then be limited to 10 or 20 product items. With iPACK Retail you can display up to 1,500 products with no additional charges. Each month your website is submitted to the top 15 search engines for indexing. iNET image, Inc. since 1996 has maintained the highest level of service to its customers. Before you decide on a website solution make sure you will have the support you will require. 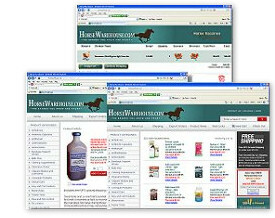 Your first month of Value Hosting is included with the iPACK Retail Complete Website Package. After that, a low monthly fee of $39.95/month includes all of the services listed above. Already have a website? Want to update your pages and product information? Plug RealTime in! iNET RealTime Retail is a custom configured system that integrates into your existing website and allows you to display and manage your products on the Internet in real time or use our system to create your web pages. With the Real Time System, product listings can be added, edited or removed from your web site in minutes without the user having any knowledge of HTML or website design. Completely eliminates tedious HTML configuration of shopping cart buttons! Add product listings to your website in less than one minute from any computer connected to the Internet. Add as much or as little information desired about each listing in real time. Edit or delete existing listings. Display products with thumbnail and enlarged photos. Use the RealTime System with a shopping cart, which configures and displays "add to cart", "view cart", and "check out" buttons. Manage thousands of items. The RealTime System has been tested and is being used on sites with over 20,000 products. Make your listings completely searchable to your prospects and customers. Web pages displaying product specifications and photos. Dynamic web pages that match you website's look and feel. All configuration for shopping cart integration. Product summary listing displayed by category or search query. ** Price includes one year domain registration, server account setup, first month of standard hosting (a $49.95 value), RealTime system configuration, and installation. The iNET RealTime Cartmanager model includes a full Cartmanager Shopping Cart.Cartmanager offers a shopping cart system that allows your web site to collect credit card information over a secure server.